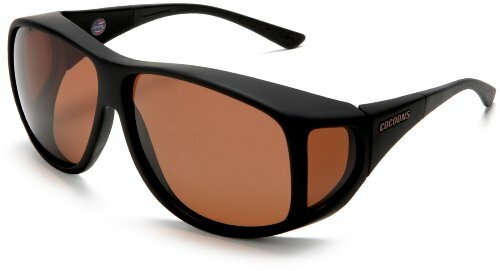 FEIDU - Features ballistic nylon soft-touch frame, scratch-resistant lenses, and Flex2Fit adjustable temples. Versatile and stylish, they are ideal for those that don't wear corrective eyewear too. Fit-over sunglasses designed to be worn with prescription eyeglasses. Aviator xl fits over frames up to 5 1/2"w x 2"h 140 mm x 51 mm. Case and cloth included. Cocoons is there when you need them. These patented sunglasses are designed to fit over almost any prescription eyewear and with their extensive technology, they will provide you with a polarized view, while delivering optimum protection against harmful UV rays. Cocoons - Fits over prescription frames measuring less than 133 mm in width by 39 mm in height 5 1/4 inches in width by 1 1/2 inches in height. Features:polarized uv400scratch resistantFlex2Fit TemplesProduct Specifications:Manufacturer: Cocoons Fit-over sunglasses designed to be worn with prescription eyeglasses. Polarized uv400 - scratch resistant - Flex2Fit Temples - Lifetime Warranty. Case and cloth included. Slim line m fits over frames up to 5 1/4"w x 1 1/2"h 133 mm x 39 mm. Features ballistic nylon soft-touch frame, scratch-resistant lenses, and Flex2Fit adjustable temples. Corelle 6003911 - Fit-over sunglasses designed to be worn with prescription eyeglasses. Product built to North American Electrical Standards. A party favorite, this classic 1-quart bowl won't spend much time in the cupboard. Highly functional and versatile, coleslaw at a picnic, it's suitable for generous dinner salads, and any half-gallon serving for a hungry crowd. Dishwasher safe for long lasting patterns. Coordinate with popular corelle dinnerware patterns. The appeal of the bright white appearance offers a simple design that is stackable for space-saving flexibility. A unique lamination process turns layers of glass composition into a durable yet lightweight product that's chip-resistant and safe in the microwave or oven, freezer and dishwasher. Corelle Livingware 1-quart Serving Bowl, Winter Frost White, Pack of 3 - Heat up chili in this super bowl, and easily store any leftovers. Slim line m fits over frames up to 5 1/4"w x 1 1/2"h 133 mm x 39 mm. Features ballistic nylon soft-touch frame, scratch-resistant lenses, and Flex2Fit adjustable temples. Microwave and oven use for versatility. Complementing the full line of dinnerware in Winter Frost White, this serving piece fits every season.